We digitally print each design onto a range of base fabrics, using eco-friendly, water-based inks. No additional chemicals are used in the printing or preparation process. All our designs are crafted by independent surface designers who receive a commission on every sale. 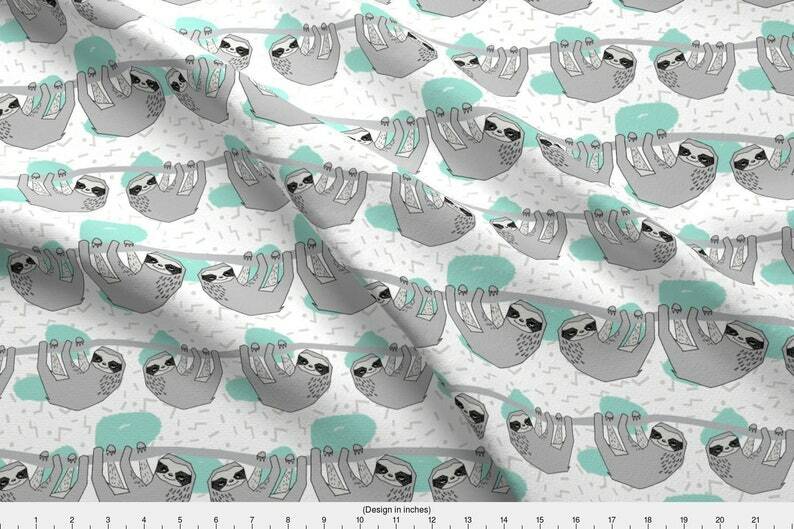 By ordering from Spoonflower, you help an independent designer earn a living. -BY THE METER: The width of a meter will depend on the type of fabric you choose, please scroll down to see the respective width for each fabric option. We do not offer half meter. We do not print on the selvedge. -FAT QUARTER: A fat quarter is a quarter meter of fabric that measures 50cm by half the width of specific fabric you choose. -SWATCH: Our sample swatches measure 20cm x 20cm. Not sure what fabric type to choose or how the colors will look once printed? Order a sample swatch first! - Appropriate for basic craft projects, simple quilts, and bag liners. - Appropriate for quilting, shirting, dresses, window treatments, nursery and home decor. - Appropriate for quilting, shirting, skirts, dresses, pajamas, and home decor. - Estimated shrinkage: 9-11% in length and 5-7% in width. - Interlock knit stretches along the crosswise grain about 25%. - Appropriate for t-shirts, dresses, baby clothes, layettes, and blankets. - Appropriate for swaddle blankets, bibs, burp cloths, and reusable bags. **Prints are likely to be off-grain. For softest feel, choose lightly colored designs. - Appropriate for quilting, curtains, table linens, bedding, clothing and pillows. - Appropriate for adult and baby apparel including loungewear, leggings, and t-shirts. - Appropriate for curtains, tablecloths, tea towels, dresses, bags, and pillows. - Appropriate for home decor, drapery, table linens, pillows, tote bags, pants, coats and jackets. - Appropriate for t-shirts, tank tops, dresses, maxi skirts, headbands, scarves, and baby clothes. - Appropriate for athletic apparel, leggings, swimwear, yoga pants, and dance costumes. - Appropriate for upholstery, bags, home decor, outdoor pillows, toys, play mats, and jackets. - Appropriate for quilting, blankets, lounge wear, plushies, and cold weather accessories. Super schöner Stoff! Tolles Material. Vielen lieben Dank! For best results, we recommend washing these fabrics with phosphate free detergent in cool or warm water using a gentle or delicate machine cycle. We also suggest washing before use. Which Fabric is Best for Quilting? For quilting projects, we recommend either our Kona Cotton or our Organic Cotton Sateen. The Kona Cotton is 100% combed cotton fabric, premium quilting weight with a soft hand and 42" printed width. Organic Cotton Sateen is 100% organic cotton sateen with a subtle sateen finish and supple hand, featuring a 56" printed width. You can find more details about all of the fabrics we offer in the Description section of each and every listing! Unfortunately, we not able to offer wholesale pricing or bulk discounts through our Etsy shop. Can I Order multiple Metres as a Continuous Piece? We do print multiple metres as a continuous cut, just be sure to select "Metre" from the amount drop-down, then select the number of metres you would like as the quantity when adding the item to your cart. Are any of your fabrics suitable for upholstery? Depending on the final use, a treatment with stain or water repellent product might be advisable for upholstery projects. A fat quarter is a quarter metre of fabric, but instead of being a long, skinny rectangle, is a rectangle that measures 50cm x half the width of fabric you choose(for our Basic Cotton, for instance, this would be a rectangle measuring 50cm x 53cm). *** Please note that all fat quarters come in separate pieces. If you order more than 1 fat quarter, they will NOT print as continuous length.